Táin Bó Cúailnge ("the driving-off of cows of Cooley", more usually rendered The Cattle Raid of Cooley or The Táin) is the central tale in the Ulster Cycle, one of the four great cycles that make up the surviving corpus of Irish mythology. It is written in Old and Middle Irish, mainly in prose, with some verse sections, especially at moments of heightened tension or emotion. 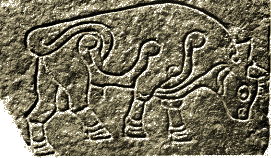 The tale relates a war against Ulster by the Connacht queen Medb and her husband Ailill, who intend to steal the stud bull Donn Cuailnge, and the efforts of the teenage Ulster hero Cúchulainn to oppose them. The story proper begins with Ailill and Medb, king and queen of Connacht, assembling their army in Cruachan, their capital. In the first recension the purpose of this military build-up is taken for granted. The second recension adds a prologue in which Ailill and Medb compare their respective wealths and find that the only thing that distinguishes them is Ailill's possession of the phenomenally fertile bull Finnbhennach, who had been born into Medb's herd but scorned being owned by a woman so decided to transfer him to Ailill's. Medb determines to get the equally potent Donn Cuailnge from Cooley to balance the books with her husband. She successfully negotiates with the bull's owner to rent the animal for a year until her messengers, drunk, reveal that they would have taken the bull by force even if they had not been allowed to borrow it. The deal breaks down, and Medb raises an army, including Ulster exiles led by Fergus mac Róich and other allies, and sets out to capture him. The men of Ulster are disabled by a curse. The only person fit to defend Ulster is seventeen-year-old Cúchulainn, and he lets the army take Ulster by surprise because he's off on a tryst when he should be watching the border. Medb takes the bull, but Cúchulainn prevents her from taking him back to Connacht by invoking the right of single combat at fords. He defeats champion after champion in a stand-off lasting months. When Fergus, his foster-father, is set to face him, Cúchulainn agrees to yield to him on the condition that Fergus yields the next time they meet. Finally there is a physically and emotionally grueling three-day duel between the hero and his foster-brother and best friend, Ferdiad. Eventually the Ulstermen start to rouse, one by one at first, then en masse, and the final battle begins. It ends after Fergus makes good on his promise and yields to Cúchulainn, pulling his forces off the field. Connacht's other allies panic and Medb is forced to retreat. She does, however, manage to bring Donn Cuailnge back to Connacht, where he fights Finnbhennach, kills him, but, mortally wounded himself, wanders around Ireland creating place names before finally returning home to die of exhaustion. The image of Cúchulainn dying, tied to a post so that even in death he might face his enemies standing, adopted by early twentieth century Irish republicans, does not come from the Táin but from a later story. However it has been incorporated into some oral versions of the Táin, in which Cúchulainn dies from wounds sustained during his final duel with Ferdiad.